This has to be one of the easiest recipes ever! Its soo easy there is pretty much no recipe to it, but I’m sharing it because my family loves it and I can make it in 20 minutes in the morning (or night before) pop it in the fridge and then when dinner time rolls around I can throw it in the oven for an hour while I make amazing Cheesy Garlic Bread | and then dinner is done! This recipe is nothing new at all but I do tend to forget about it until the other day I wanted spaghetti with meat sauce, no meatballs just plain old ground beef in the sauce, which led to me remember how good spaghetti is the next day after it has been in the sauce all night, so I figured if I made the spaghetti ahead of time it would get the same effect as leftover spaghetti and while I’m at it, why not throw some mozzarella cheese and pepperoni on top? It turned out great and took no time to prepare. You can use jarred pasta sauce or homemade and go ahead and top it like you like your pizza, toss some black olives or mushrooms on there, maybe some ham and pineapple or even anchovies (bleh) lol. This is such a simple dish and for a busy mom like me I find I have a ton of time and energy in the morning but as the day wears on I wear out so being able to just take this out of my fridge and pop it in the oven was a lifesaver on a busy night when I had a 2 year old glued to my leg. I hope your family likes it as much as mine! Mix sauce and spaghetti together. 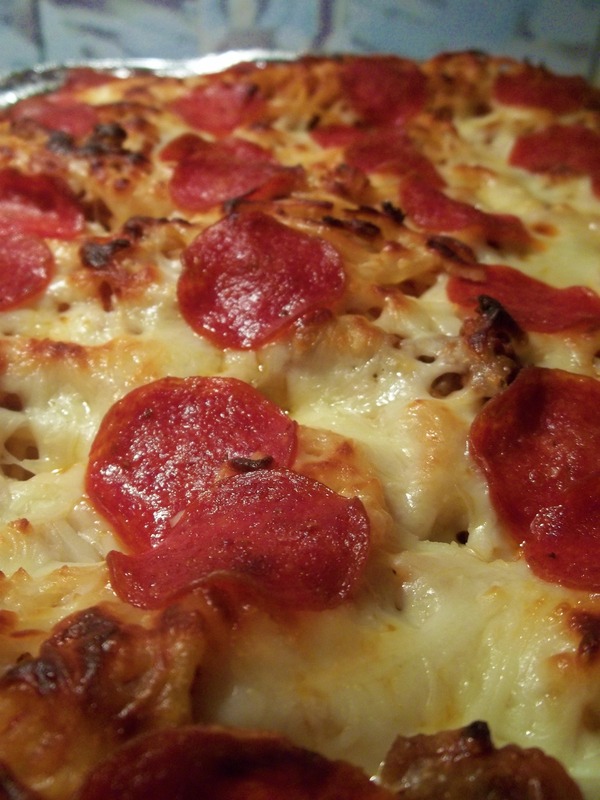 Top with mozzarella cheese and pepperoni and additional toppings. Cover with foil and throw into fridge. When ready pull it out and put into 375 oven covered for 30-45 minutes, then uncover and bake until bubbly and cheese and pepperoni are browned.